The nights are growing darker and there’s a chill in the air. Halloween is almost upon us! 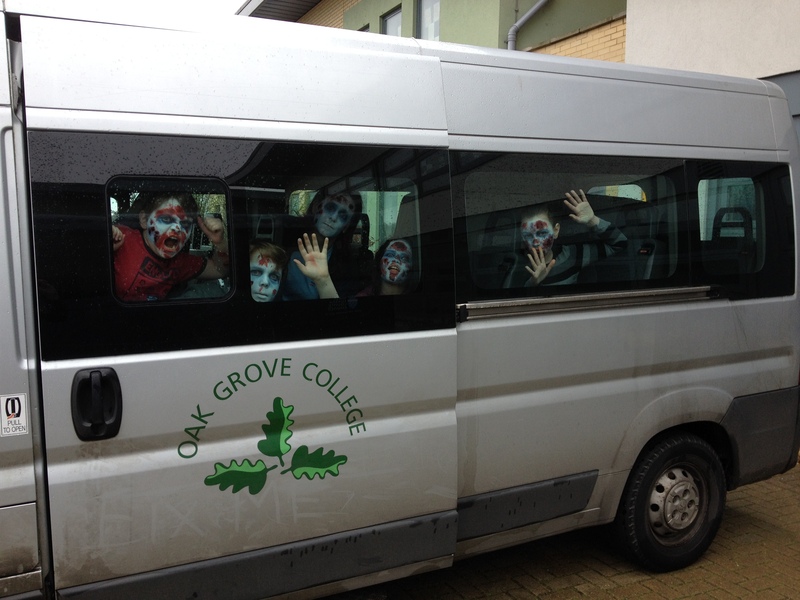 To celebrate the season, I have some scarily good workshops for your school or club to enjoy. 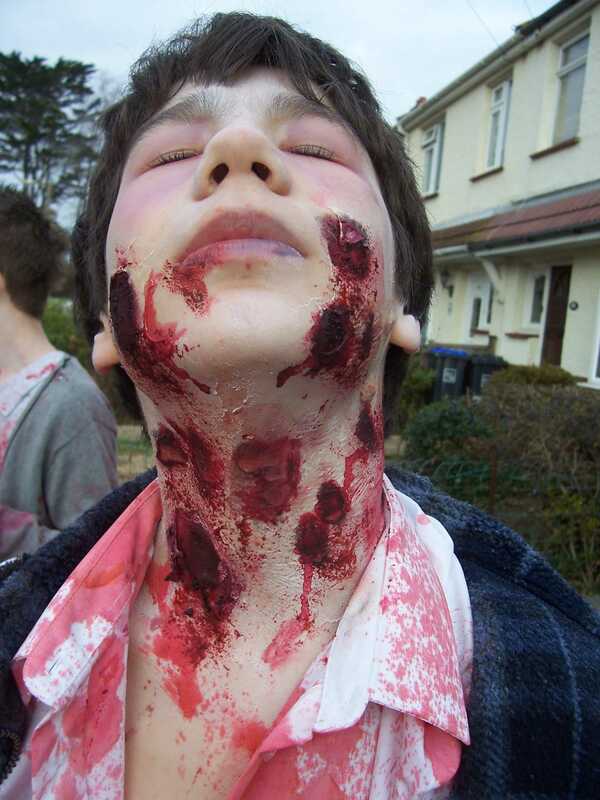 Transform into a gory zombie using professional special effects make-up techniques. Work as a group to make shape-shifting ghosts and ghouls materialise using hand drawn animation techniques. 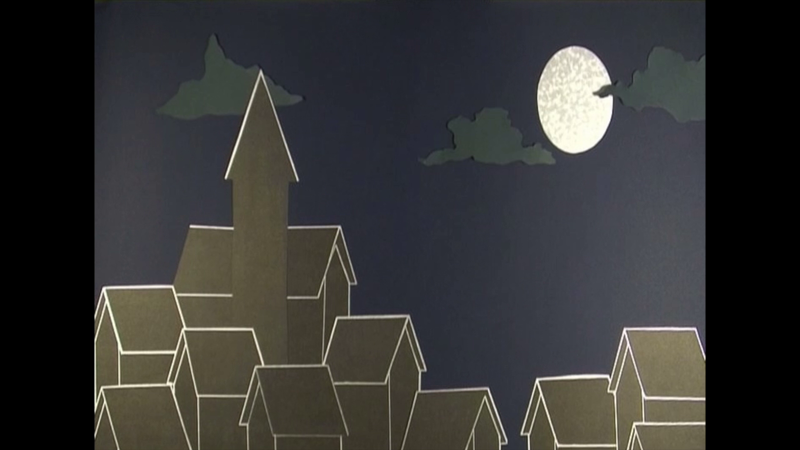 Use paper animation techniques to create a haunted house filled with things that go bump in the night. Each workshop is a 3 hour session with all materials and equipment provided. Workshops are suitable for all ages and abilities. Email contact@evanwilkinson.co.uk to book now. Availability is limited so book early to avoid disappointment. *Workshops are charged at £150 within the local Brighton area. Work outside of the Brighton area may necessitate further charges. 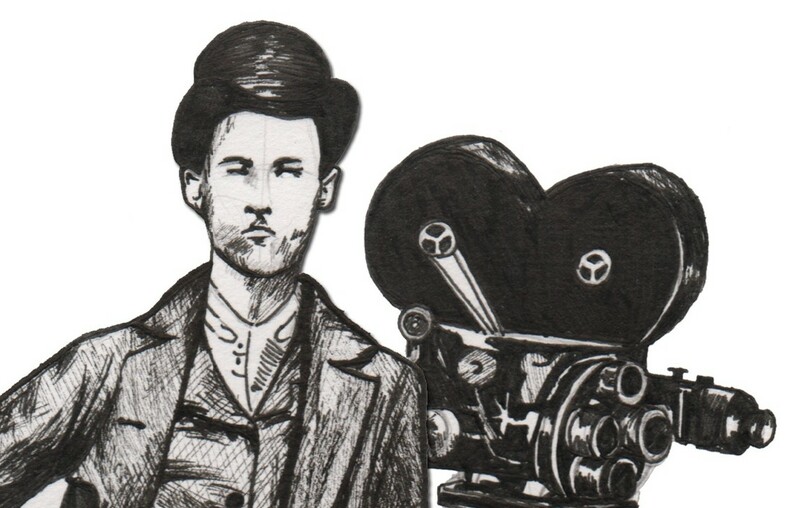 Evan is a local filmmaker with over 15 years of experience in delivering workshops and providing industry training. He is currently an industry tutor at the Brighton Digital Media Academy. Visit http://evanwilkinson.co.uk for more information. This entry was posted in Animation, Makeup and tagged Animation, animation techniques, Apparition, Art Director, arts, Blood, brighton, Bruise Wheel, Burns, Community, Cut Out, Cut Out Animation, Drawing, Education, Evan Makes Films, Evan Wilkinson, evanmakesfilms, evwilko, Film, Fresh Scab, Ghosts, Ghouls, Gore, Halloween, Haunted House, Horror, Make Up, Make Up Artist, Makeup, makeup effects, Paper Animation, Scary, Skills Training, Special Effects, Spirits, Workshops, wounds, zombie, ZOMBIES on September 15, 2015 by Evan Wilkinson. 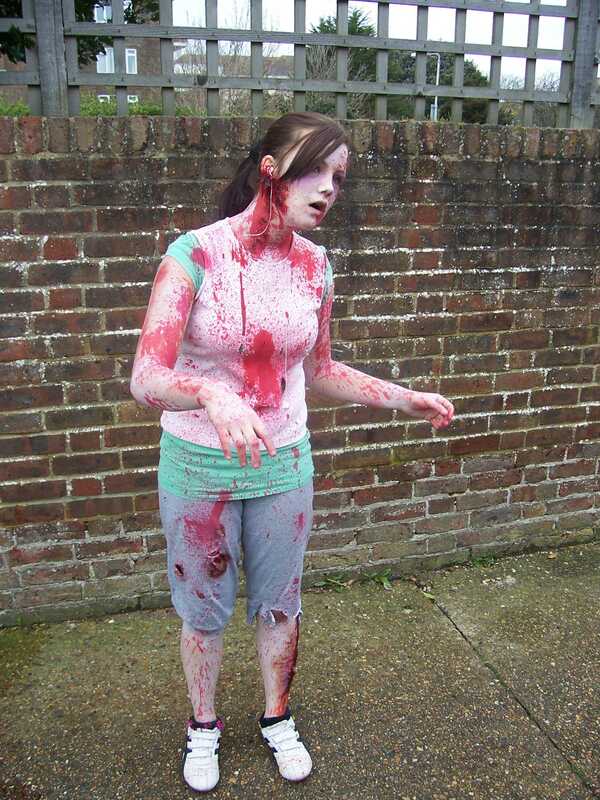 In my last post I talked about making props for the short film Outbreak with Worthing Youth Media. Now I am going to discuss in more detail how we designed and created specific character looks for our zombies. I’m a HUGE fan of George A. Romero, so working on this short was a dream come true for me. The first consideration was to populate the film with zombies who represented a cross section of society, the Zombie Apocalypse is coming for all of us, after all. During preproduction for the film I was like Simon Pegg in the opening scenes of Shaun of the Dead, imagining the slow zombification of the world unfolding around me. I started working on a sketchbook of zombie characters, and encouraged my art department team to do the same. In order to create characters, I encouraged the team to consider who this person was before they were bitten, how and where they had died, how long ago they had turned and what their zombie-self might have encountered since as all of these things can be conveyed by the zombie’s appearance. As we moved closer to the shoot, we began shortlisting our zombie cast, using the action an locations of the script to help in our decisions. 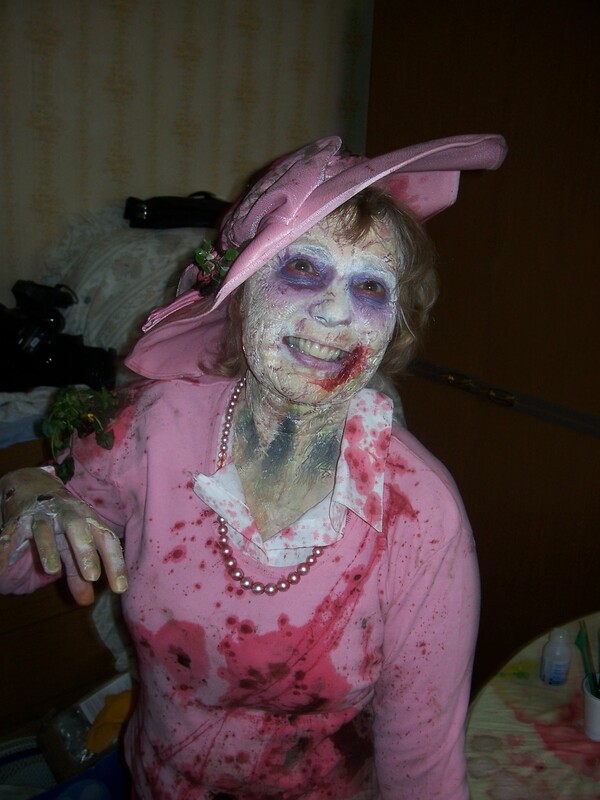 With our zombie cast locked down, we started sourcing the costumes that would bring our undead characters to life. Clothes and accessories were then sliced, ripped, sand-papered, burned, dirtied up and covered in blood as we matched the outfits up to our actors. On the first morning of the shoot, I was the go-to guy for blood. I carried three our four different types of fake blood on set at all times, including two spray bottles that I used to cover actors on set before the director called action. In between takes, my team and I were on hand to reapply blood and keep wounds looking fresh. By the end of the week my hands and arms were stained red up to the elbows. All of the zombies had a basic look that was consistent. 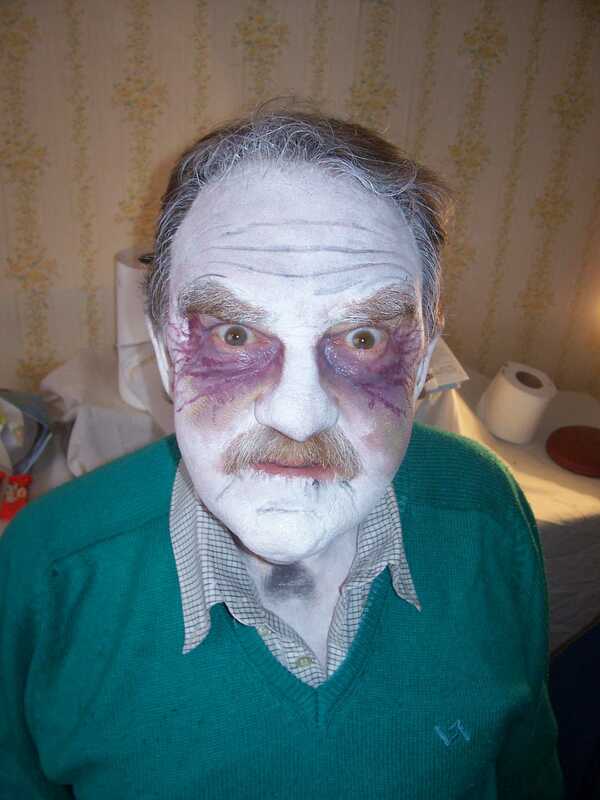 Each zombie was painted white, with a blend of purple and mustard bruise colours around the eyes to create a decaying look. Following that, zombies were given their own individual wounds and grotesqueries. 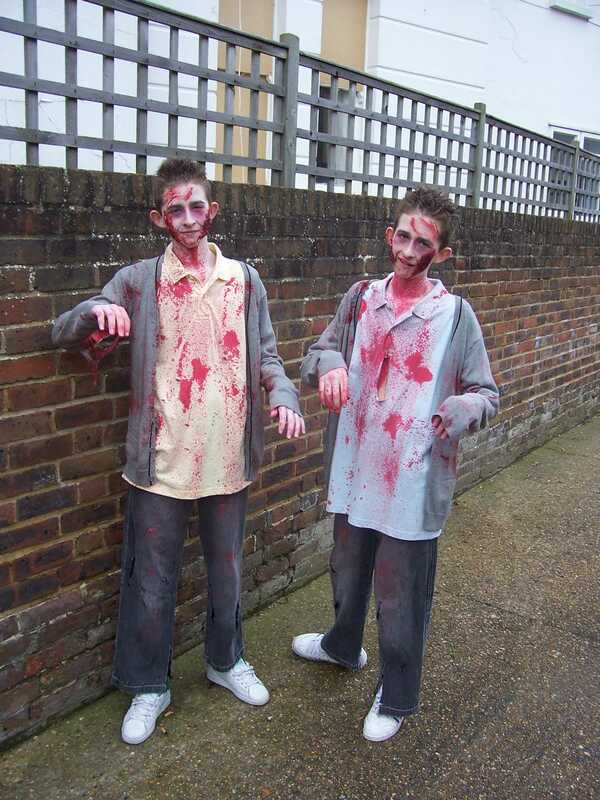 The exception to this rule, were the identical zombie twins, who were given matching mirror image misfortunes. 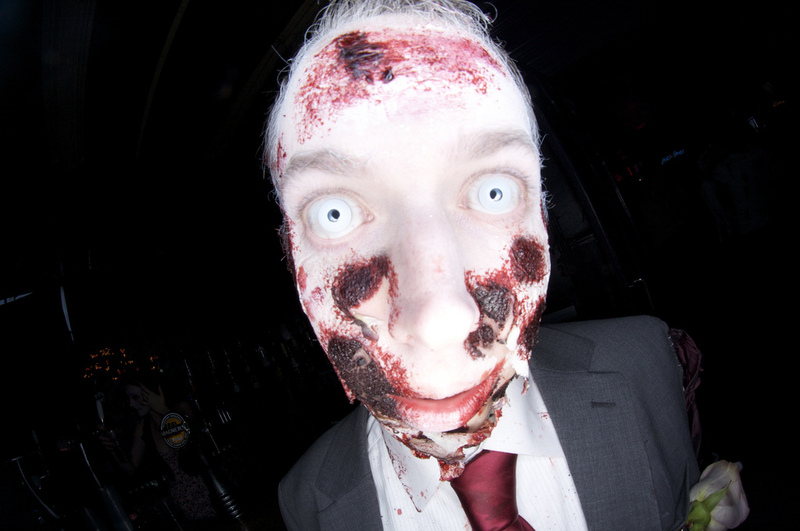 We discussed the use of contact lenses to give the zombies that dead eyed look, however, there were a number of reasons that this wasn’t affordable, practical or safe for use with young children. Instead we used a red eyeliner to give the eyes an evil look. Although the cause of the zombie outbreak is not explained in the film, in my designs for the characters I envisioned it like a disease with the red eyeliner providing a swollen, puffy, infected look. 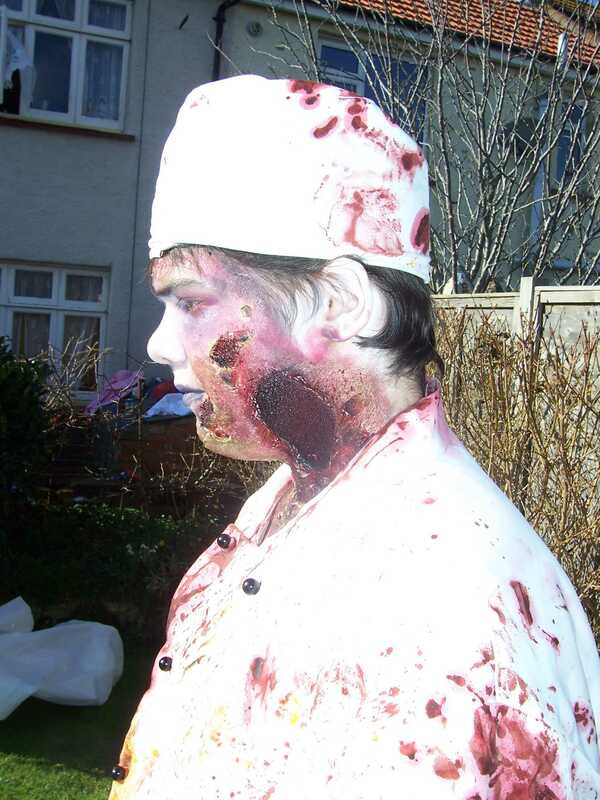 To add further detail I used latex to create the look of broken skin, burns and lesions. Tested here on a zombie extra. The effect is achieved by building up layers of liquid latex onto the skin and then piercing and tearing it to make holes. These holes can then be worked into with makeup to add colour and definition. I like to use black as a base to create the illusion of depth, and then add a purplish red followed by fresh scab for texture. 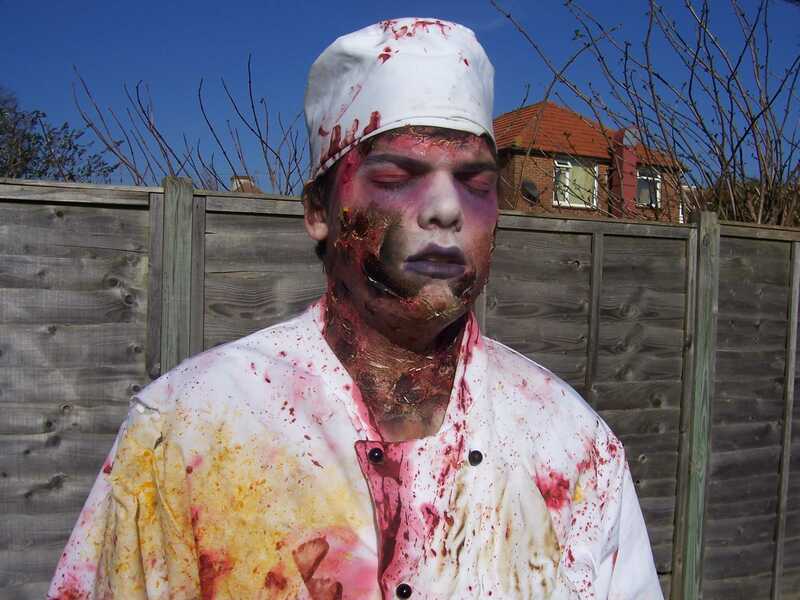 Zombie Chef, the script’s most intimidating zombie, required a more complicated look as he is the main antagonist of the film. We wanted to make him look scary and burned, as he met his death in a kitchen. We started with a typical chef’s costume, which was then distressed by being torn and burnt. 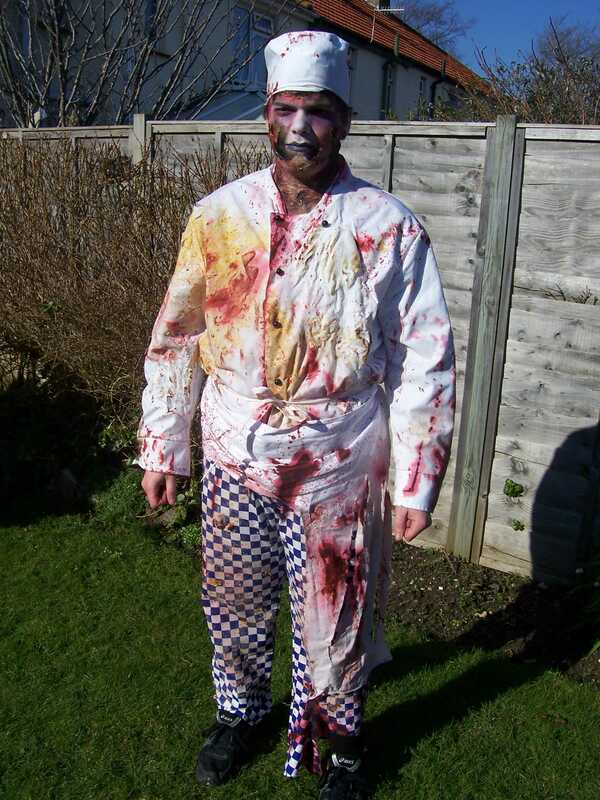 We wanted to exaggerate his look to make him quite extreme so we covered the outfit in food stains and blood. 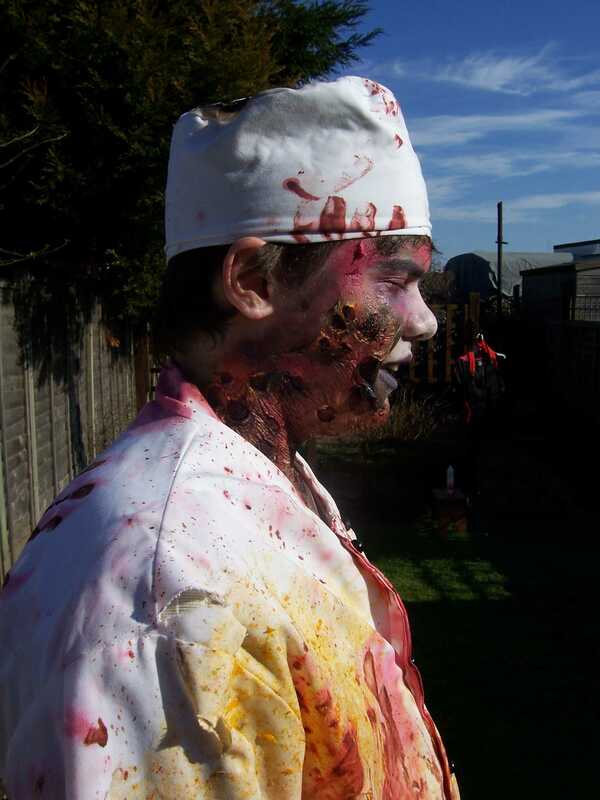 Zombie Chef had one of the most complicated makeup looks in the film, made all the more difficult because his scenes were shot over two days, meaning that the makeup had to last a full day’s shooting before being recreated as exactly as possible the following morning. I started by giving him a foundation of white skin, with purple around the eyes. I find that the eyes usually need retouching again at the end, but it helps to have a foundation to work with. I then covered the actor’s face and neck with several layers of liquid latex. The operation was time consuming as each layer of latex needed time to dry before another could be applied. Having achieved a good layer of latex, I then ripped holes of varying sizes, using a pencil to break the latex. We took photographs of every stage so that the look could be recreated the next day. When creating the look for the second time, I referred to the previous day’s photos and used the pencil to draw onto the latex so that I knew exactly where the holes needed to be. The next job was to add definition and shading to the holes using a variety of colours. We wanted to create a charred skin effect and so we used a lot of reds and purples to make the skin look scorched and sore, then yellow and green hues as highlights around the edges. Finally, we added texture to the wounds using fresh scab again. I love using fresh scab, it has a consistency like raspberry jam and it sticks to the skin and slowly dries to look like a nasty scab or graze. 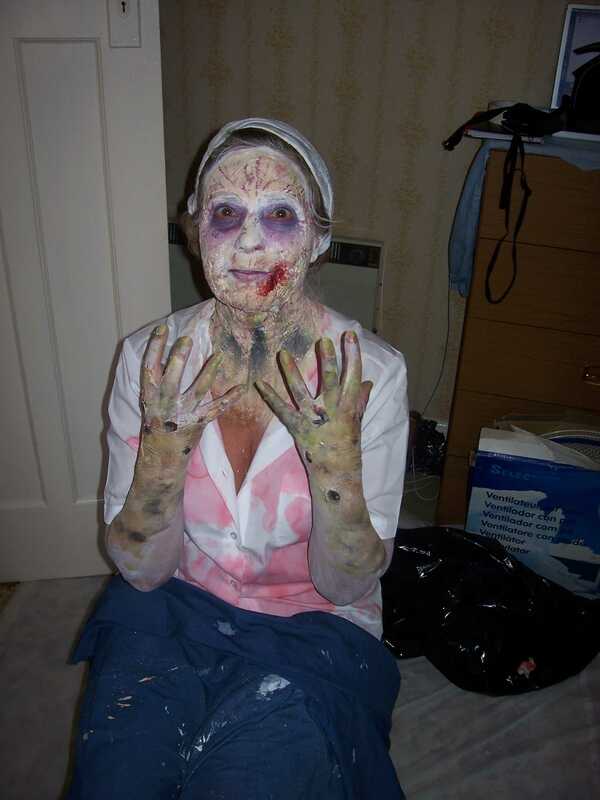 The longest makeup job on set had to be the Old Lady Zombie as we needed to create a combination of zombie and ageing makeup. We decided that not only was Old Lady Zombie old, but she’d been a long time dead so we wanted her to look really decayed and grotesque. I started out in the same way that I approached Zombie Chef’s makeup, starting with a white foundation. This time instead of applying the liquid latex directly onto the skin, I used it to apply small pieces of tissue paper all over the actress’s face and neck. As it dried, this created a leathery, wrinkled skin effect. To give a sense that her skin was rotting I then blended white, yellow and green makeup for an all over tone, before using blues and purples for depth and shading. Finally, to add to the aged and rotting effect, I used a fine paintbrush to paint veins all over her face and neck. Red eyeliner was used again to give the eyes an evil look. 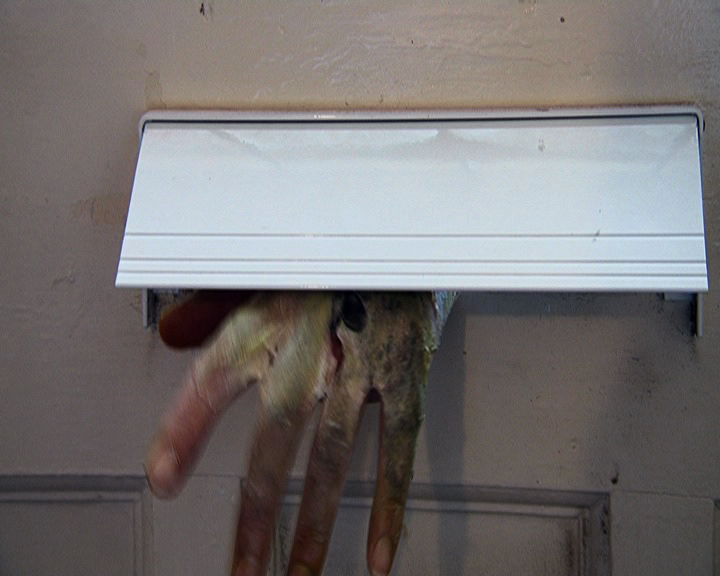 As well as making up her face I also applied makeup to the actress’s hands and arms, as I knew that there would be a shot in which this character reaches through the letterbox. I covered the actress’s arms in latex, before using a sponge to apply greens, yellows and browns for a mottled, rotten look. 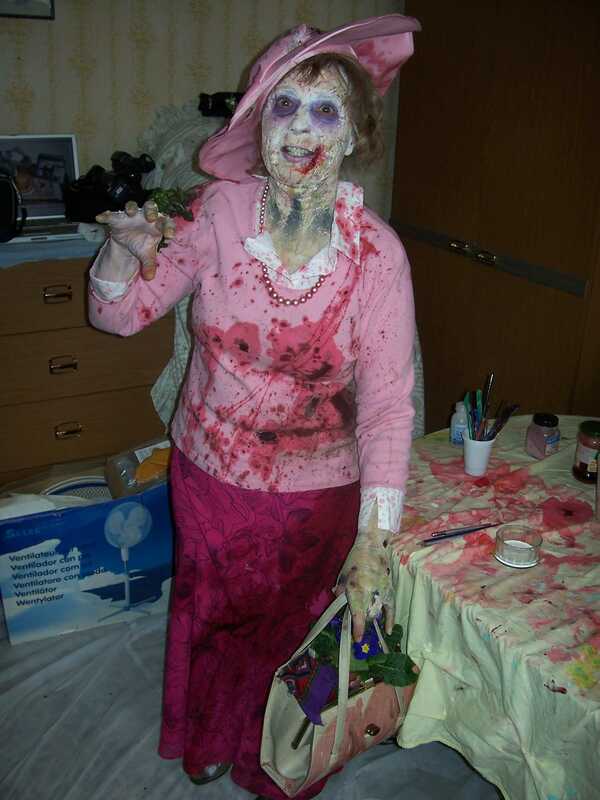 Old Lady Zombie was a comedy character in the original script, and although her scene was rewritten, we still wanted to keep the same sense of fun in her overall look. The original script described her as a WI member. We chose a matching outfit for her with an ostentatious hat. The costume was then ripped and covered in the customary amount of blood, before the addition of dirt and flowers to give her that ‘Just Dug Up’ look. It was a shame not to see more of the character in the finished film, but that’s life in the art department! The final makeup challenge for this film was a zombie movie staple – the zombie bite: a protagonist is bitten by a zombie and we watch their slow transformation into the undead. This was my homage to Dawn Of The Dead‘s Roger. What was fun about this effect was that there were stages to the makeup that we enhanced from scene to scene. We don’t see Derek get bitten by the zombie. First, we see that Derek is feeling unwell. This shows up better on video than as a screenshot, so check out the movie below to see the full effect. We wanted to introduce elements of the zombie design slowly and subtly, hinting at what’s yet to come. I gave the actor a light covering of the white zombie foundation, enough to make him look unnaturally pale. I also wanted to show that the change was already beginning, and so I used a mustard colour around his eyes. I thought that yellow would give the actor a sickly hue, and it is also a colour that, once blended with different shades of purple, contributed to the look of the other zombies in the film. I then created the appearance of sweat by applying glycerine with a stipple sponge. This had to be reapplied between takes to give him an unhealthy sheen and a feverish look to show signs of the infection. At this point Derek’s zombie bite is revealed to the audience. This is the only human injury we see in the film and we wanted it to be shocking. We wanted it to look serious, definitely an injury that could kill if not seen to immediately. I went about this in the same way as the other wounds, but on a larger scale. First I used black and various purples and reds to create a bloody looking area. I created two small bones using bone wax, which were attached to the skin and covered with a layer of liquid latex to keep them looking clean and white, so that they wouldn’t soak up any of the blood. I then used tissue paper, building up a layer of latex skin over the injury which was then ripped open to expose the wound and bones beneath. 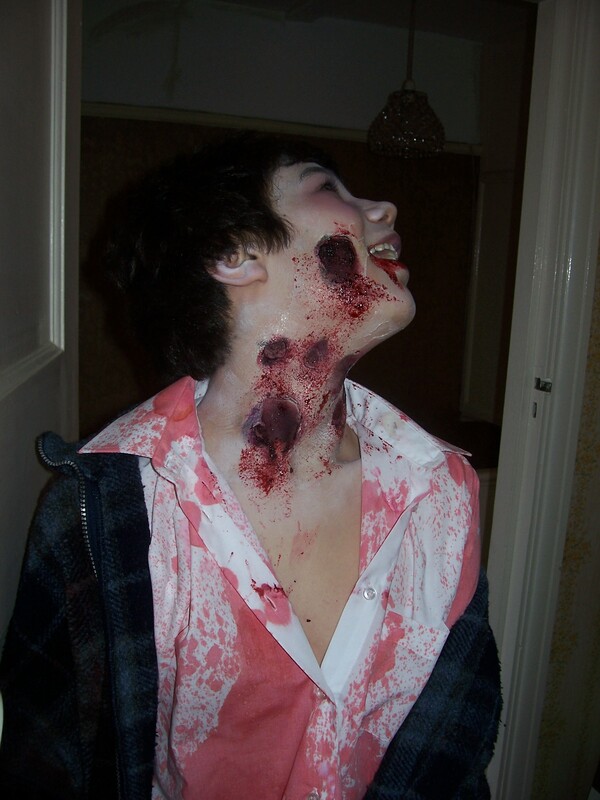 I used wound filler to add texture and extra gore to the wound, and of course, plenty of fake blood. The ‘skin’ was blended into the rest of the arm using a natural foundation. 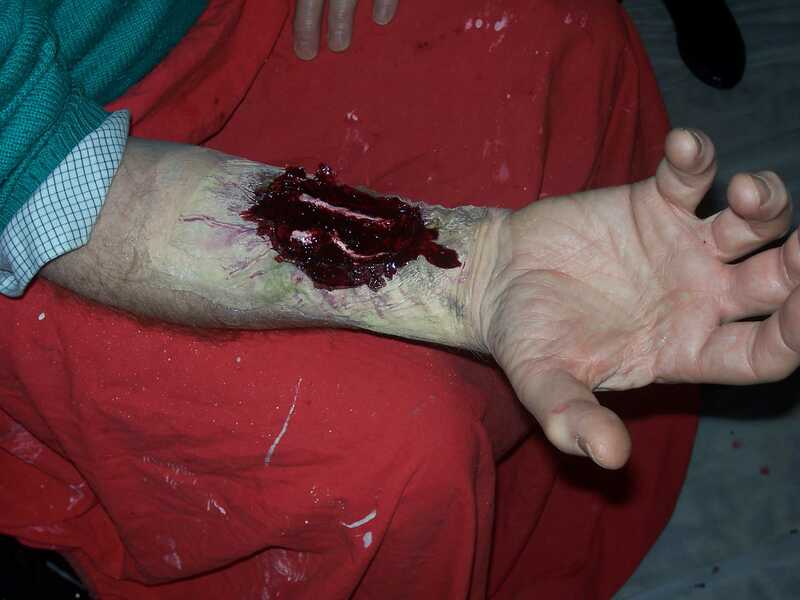 As this wound was the source of the infection we wanted to make it look as if it was already rotting, so we blended yellows and greens into the skin. To further represent the zombie virus spreading into the body I painted a vein effect spreading out from around the wound. 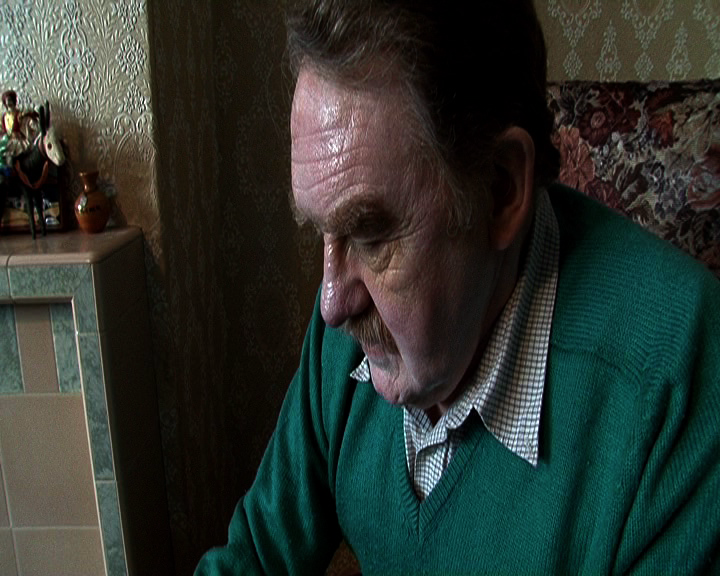 The final stage of Derek’s transformation was to reveal him as a zombie in the climactic scene. This involved a slightly different design from our regular zombies because Derek was a protagonist so we wanted to show him as a tragic, rather than as a scary zombie. 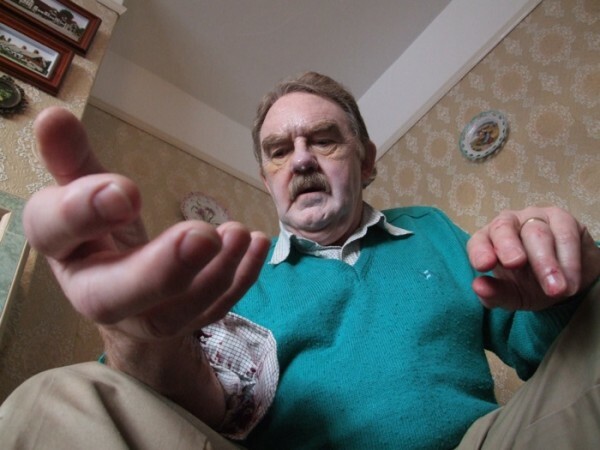 Also because Derek had only just turned, he would not look as rotten or weathered as the other zombies, and we couldn’t cover him in injuries, because he hadn’t sustained any beyond the bite to his arm. I gave him the same white face as the other zombies, then exaggerated the lines and features of the actor’s face and neck with blue shading, which I blended into the white to make the colour less bright. I then increased the yellow shading around his eyes and layered purple over it. Building on the idea of showing the virus’s spread, I designed Derek’s eye makeup to mirror the veiny style of his wound, spreading out through all of the creases around his eyes. I love zombies, and I especially love doing zombie makeup, so watch this space for more zombie experiments and to see me as a zombie too. 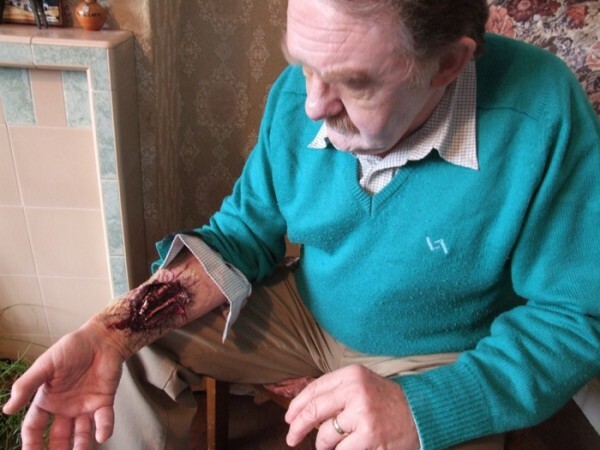 I also run workshops in Special Effects Makeup so if you’re interested in having a go yourself, take a look at my website. This entry was posted in Makeup, Portfolio, Short Film and tagged Blood, Bruise Wheel, Burns, Character design, costume, Dawn of the Dead, Evan Wilkinson, evanmakesfilms, evwilko, exposed bone, film outbreak, First Light, Fresh Scab, george a romero, Gore, Horror, Latex Effects, Liquid Latex, Living Dead, Makeup, makeup effects, SFX, Short Film, Special Effects, torn skin, Undead, Worthing, Worthing Youth Media, wounds, Youth, Youth Projects, zombie, zombie apocalypse, ZOMBIES on May 31, 2013 by Evan Wilkinson.